This session's goal was to introduce students to each other and demonstrate the potential for future friendships and partnerships on class projects. All these students plan to pursue doctoral degrees in the sciences. As an introvert, I was surprised by how easily I was able to begin conversations with people I had never met before and even want to continue talking past the three minute mark. It was really an effective method of breaking the ice and getting to meet your peers. "Through the session, I was able to get to know my classmates and learn about their research interests, majors, and hobbies. It was a great way to get to know their names and start open conversation with them. I also got to see who had similar research interests as myself. It would be great to collaborate or work with them in the future in looking for opportunities and in working on research topics. I also realized that many of my classmates were in the same boat as me with the lack of research experience, and it made me feel better about the lack of experience I have." I learned a lot about my fellow students. Most people in this class are interested in the sciences, particularly the fields of biology and chemistry.. Most students also seem to be on the pre-professional tract. I think a lot of students see the class as an opportunity to get involved in research. 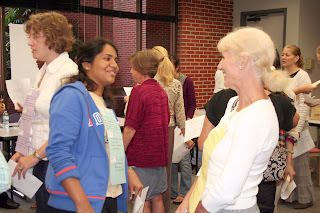 Though most conversations were about the general questions such as your major and classes you are taking, there was other topics that were more fun and carefree. I was surprised by how curious others were about me. I thought the meeting would be awkward, but it turned out to be a great session. People were asking me all sorts of questions after reading my info card. Likewise, I was more engaged after being asked so many questions and started asking plenty of questions myself. The goal of this session was to understand the basics of collaboration development towards the objective of identifying a faculty mentor in science or engineering. 15 students and 15 faculty participated. I was impressed with Bess' introduction. Specifcially the levels of risk one is will to take to interact with others. I think she hit the nail on the head. To successfully collaborate, the partners must be willing to change behavior for the potential of a successful venture. I also liked the discussion of assets. This pre-discussion is/was particularly important for our young scientists. The actual interactions between students and faculty were fun and it was striking the similarities that were written on our placards, despite significant age/experience differences. I really enjoyed meeting the students and pleased that we have such motivated young women. 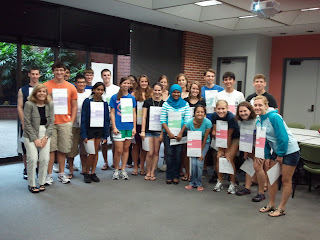 We certainly met new people (one of the objectives), but it is not clear that the students identified new mentors. Our interests were quite varied. On the other hand, the faculty regardless of discipline should have a lot of experience that they could pass on. Perhaps time will tell. I learned that there must be some inherent and common drive in women who enter science. Another experiment! The UF College of Fine Arts wanted to present a CoLAB session for their faculty in the 3 schools: Music, Theatre/Dance/Design and Visual Arts. The problem was lack of time. I was appropriated 1:30 minutes in which to make this happen: signs were ready but participants had to insert their personal answers to questions about their personal passion, their skills and future recommendations for changes with the school, college or UF systems. 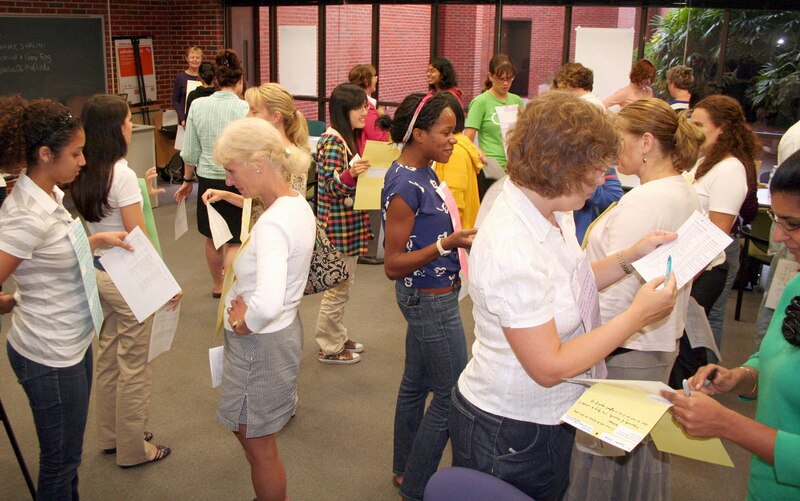 We've got a lot of great photos (shot by Barbara Hood of this facilitated process. The location was a renovated women's gym at UF that presented natural light and two floors with a useful ledge around the balcony for preparing signs. Approximately 100 participated and were able to have 10 focused conversations with colleagues from schools different from their own. Although faculty were extremely skeptical about the process, it was a huge success. The Dean Emeritus, Dr. Donald McGlothlin commented, the college "had tried many times to create a networking environment, but this was by far the most successful of all previous attempts." The process was so successful that some faculty are using it to help graduate students connect with each other's passions and assets.